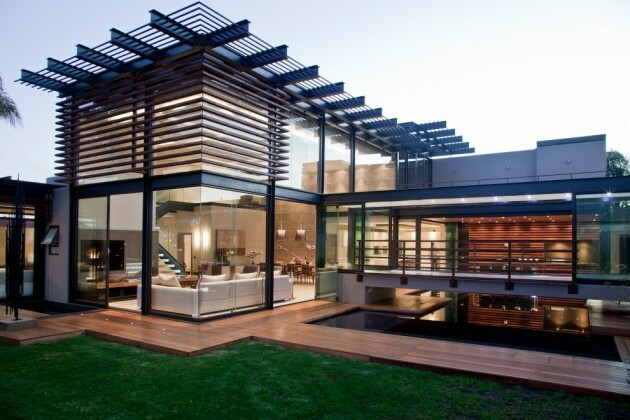 Nico van der Meulen Architects have designed the House Aboobaker in Limpopo, South Africa. 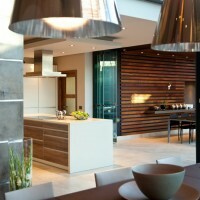 After careful consideration, the client approached our company to redesign and style their outdated home in Limpopo. It is situated on the Tropic of Capricorn where the heat is excessive, particularly in the summer months, and requires specialized treatment in ensuring an alteration and addition that will take these factors into consideration. 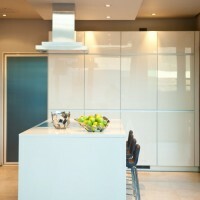 Nico’s son Werner van der Meulen, was appointed to take on this project. The brief was to transform the look of the existing visually unattractive face brick house with vaulted roofs, small windows to something stunning and modern. 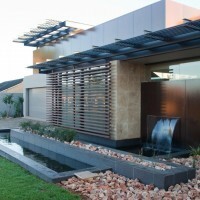 Special attention was paid to the street façade to create an inviting entrance with a water feature. The client also requested a new guest bedroom on first floor, to open up the living areas, and redesign the bedroom section which had an ‘old school’ style long dark passage. It was a very ‘unusual’ style house, a mix of varied design styles, vaulted roof with heavy masonry, making it uncomfortably hot to live in, and unattractive to look at and not been well designed. The size of the stand is 1132 sq.m., and the existing single storey house was a total of 343 sq.m. 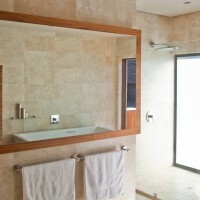 An additional 151 sq.m was added and the alterations internally were extensive. 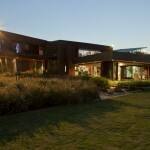 Extensive use was made of steel in varied forms, and large expanse of opening glass and double volume areas, to allow as much natural light in as possible, with sun control to allow sun into the house only in winter as well as a lightweight, well insulated structure that cools down fast in the evening, thereby enhancing the feeling of space while creating natural cooling through the use of water features and the pool. Werner ‘opened up’ the existing living rooms, created double volume spaces and within this space designed a magnificent and distinctive staircase which has become a major feature within the home, highlighted by specialized designer lighting. To enable the staircase to “float” Nico came up with a solution of a buried 6 cubic metre concrete block in which the staircase was anchored, removing the 4 steel columns the engineer insisted in placing under it. 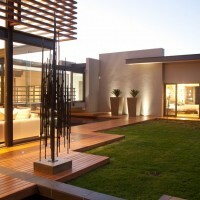 It was critical to have an open feel to the living rooms, which could open up to fully utilize indoor/outdoor living, integral with the water features and professionally landscaped garden in keeping with their local weather conditions. To this effect frameless folding doors were used extensively, enabling the house to become a verandah when required. As the building system was foreign to the local builders in the area, the architects had to coach them through the construction to ensure the vision created would be realized. The completely separate bedroom wing of the house was opened up to include vast expanses of glass and is accessed by an existing bridge over the existing swimming pool which had glass bricks making it very hot, so it was opened up by fitting glass sliding doors both sides to create cross draught ventilation at all times, and encased in steel horizontal shutters for sun control. 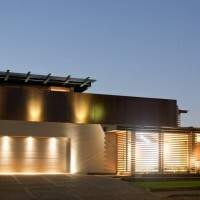 The overall design of the exterior was influenced by Rick Joy of Arizona in the USA who specializes in houses that incorporate the use of naturally rusted and sealed corten steel cladding, louvers and the basic structural elements to create a building at home in a temperate climate zone. 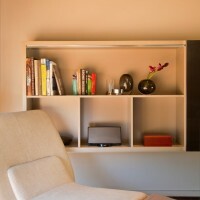 Initially the client only wanted the front section of the house, which included the entrance hall, living and entertainment areas redesigned, but on presentation of the concept was so taken aback that the decision to then include the bedroom wing and walkway was taken, creating a total overall revamp of a ‘tired’ house to a modern, light and airy, easy living home with the living spaces wrapped around a sparkling swimming pool. 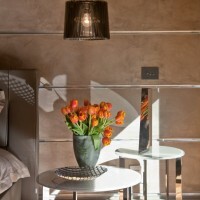 The architects in?house interior design department , M Square Lifestyle Design, run by Phia van der Meulen was responsible for the interior design. 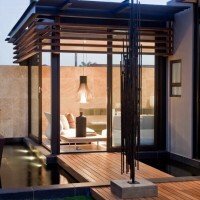 Phia has a master degree in architecture and nearly ten years experience at Nico van der Meulen Architects and understands the overall holistic approach between architecture and interior, and was appointed by the clients to design all of the finishes which include lighting, fixtures and fittings, cladding, as well as specifying the furniture which is mostly Molteni sourced from M Square Lifestyle Necessities. The use of exterior louvers influenced the design of the horizontal groove lines on the double volume plaster wall in the dining room, to create interest and character to an otherwise boring wall, which was further enhanced by low horizontal ledges with built in feature fireplace and selected works of art. The paint colours were chosen carefully to complement one another as well as rusted corten steel which added creative interest. The staircase leading up to the first floor was further enhanced by the Floss hanging pendant lights leading the eye vertically towards the double volume ceiling, creating an overall and pleasing integrated area. 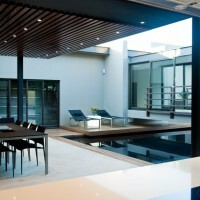 The swimming pool patio/braai area is encapsulated by a timber horizontally slatted feature wall which wraps up to the underside of the ceiling, beautifully lit and intentionally reflects back into the black painted swimming pool with timber decking surround which creates an illusion of enclosing this space. Furniture was purposely selected to compliment the architecture and interior design, and the brief by client of minimalistic opulence, supplied mainly by Molteni and C, Floss, Kundalini and Royal Britana. The entire team involved in this project as well as the clients, are extremely proud and happy with the superb end result of a project well executed. 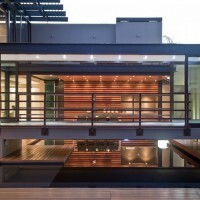 Visit the website of Nico van der Meulen Architects – here.